In 1957, a group of architecture academics from the University of Moscow published a book called the Novye Elementy Rasseleniia or “New Elements of Settlement”. This team of socialist architects and planners --- Alexei Gutnov, A. Baburov, G. Djumenton, S. Kharitonova, I. Lezava, S. Sadovskij--- became known as the “NER Group.” In 1968, they were invited to the Milan Triennale by Giancarlo de Carlo to present their plans for an ideal communist city. In cooperation with a group of young urbanists, architects, and sociologists, they created an Italian edition of their book under the title Idee per la Citta Comunista. Alicia Kurimska is a research associate at the Center for Opportunity Urbanism and Chapman University's Center for Demographics and Policy. She is the co-author of "The Millennial Dilemma: A Generation Searches for Home... On Their Terms" and deputy editor of New Geography, a website focusing on economics, demographics, and policy." 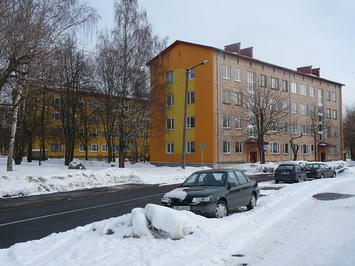 Lead photo of Krushchev-era apartment buidlings in Estonia, "EU-EE-Tallinn-PT-Pelguranna-Lõime 31" by Dmitry G - Own work. Licensed under Public Domain via Wikimedia Commons. Submitted by Inkling on Wed, 01/21/2015 - 13:46. Don't forget another major advantage of high-density housing. It makes it far easier for spies to keep an eye on these workers. Also, as those who designed Paris readily admitted, wide boulevards running at an angle to the normal street grid make it easier for a few strategically placed troops with cannons to control movement about the city. Submitted by John Sanphillippo on Thu, 01/22/2015 - 09:32. Yes, the East German Stasi and Stalin era internal spies were everywhere. And yes, the grand boulevards of Paris were carved out of the jumbled chaos of narrow Medieval streets by Haussmann and Napoleon in part to consolidate military control over the population. The current equivalent is drones and internet data mining - Conservatives worry about Big Government, liberals worry about Corporate America, but they're one and the same. If you don't think drones are (or soon will be) monitoring your house in the suburbs you're not paying attention. Submitted by PhilBest on Wed, 01/21/2015 - 17:02. Thank you for pointing this out: you beat me to it. Ironically now that Russians have been flocking to driving since they had the freedom to do so, these street networks are better than what an entire city that is a "TOD" could have been expected to be. I noticed in a UN report on cities street network intensity, that Moscow and Auckland NZ have approximately the same street network intensity. At the bottom of the pack, admittedly, and to Auckland's shame; but you will get what I mean. Submitted by John Sanphillippo on Tue, 01/20/2015 - 23:47. Yeah, I knew instantly that the lead photo wasn't Moscow or Kiev. It looks much more like the "Little Russian" commie condos from Riga or one of the other more prosperous satellite states. The ones in bigger cities were just that much more hideous. Somehow the Baltic republics managed to tone things down and make them more... Swedish. "Socialist" rather than full on communist. Like the building in the photo many of these Eastern European Soviet era apartment blocks are getting scrubbed clean, renovated, given fresh paint and landscaping, and are pressed back into service. Tearing them down and building split level ranches on cul-de-sacs would be too expensive... On the other hand, everyone had a dacha and their six sotok which were pretty damned charming in their own way. I do marvel at how Las Vegas builds exactly the same massive concrete tower blocks, puts in some tacky carpet and wall paper and faux Italian tchotchkes and suddenly it's a capitalist consumer playground. It's the same exact crap architecture. What's the big diff? You think any of those buildings were lovingly hand crafted to last for centuries? Been to Atlantic City lately? Feh! On a similar note, have you been to a Costco or Walmart in recent years? It looks like the Pavilion of Economic Achievement in there. I'm just sayin'. Ugly centrally planned concrete bunker architecture is universal. All the empires love it. Submitted by PhilBest on Wed, 01/21/2015 - 17:16. Oh come on, in the examples you give, that is just a fraction of the overall urban area's development, there is a wide variety and people get to choose. The whole point about Communism is it was top-down planning of an approved outcome for everyone. No-one forces anyone to live in a tower in Vegas or shop at Costco. I also recommend to everyone, Alain Bertaud's papers "The Cost of Utopia" and "Cities Without Land Markets". The intentions stated in the article above were never remotely realised, as growth was provided for by adding taller and taller apartment blocks further and further away along radial rail routes, resulting in greater and greater inefficiencies of average travel time and expense. But ironically, even in dense cities with functioning land markets, average commuting times tend to be outliers on the high side. It is a total myth that many people at all in, say, Hong Kong, catch an elevator down to the ground floor, stroll along the road a bit, and catch an elevator back up to their job. Their average commute time (one way) is 47 minutes. Tokyo and London are similar outliers. There are no such outliers among lower density cities, contrary to the myths, propaganda and outright lies from the opponents of "sprawl". Even in the UK's low but crowded and high density cities (5 times US densities on average) the average commute time is 50% higher than the US's average commute time. The US average is 26 minutes. There is obviously something inherently inefficient and distorted about urban land markets with strict containment of density regulations. Submitted by John Sanphillippo on Thu, 01/22/2015 - 10:03. There are two issues here. Let's separate them. First, some people really prefer living in a single family home with a front lawn and a back garden and would much rather drive a private car. Other people actually enjoy apartment living and would rather hop on a bus or train. To each his own. It's a big county. There's room for everyone. Second, there's the question of top-down state planning and control that limits those choices. In Soviet era Eastern Europe the only buildings that were built were state owned apartment towers organized around public transit. This reflected the Communist ideology that everyone was equal like bees in a hive all working to build the Communist utopia. Single family homes with a garden were a manifestation of evil capitalist bourgeois values. 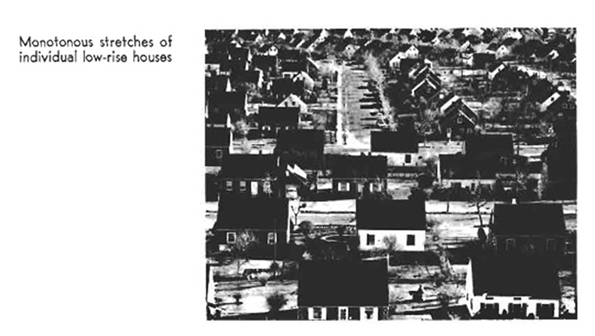 But let's examine the post WWII American suburb. It too is top down and centrally planned. Federal, state, and municipal zoning, building codes, and mortgage lending standards explicitly enforce single family home development and rigid separation of uses in order to maintain a very specific set of cultural and social arrangements to the exclusion of all others. Try and convert your single family home into a duplex. Illegal. Try and run a small businesses out of your home. Illegal. Try and build a granny cottage in your quarter acre back yard. Illegal. Try and convert a shop in a strip mall into a live/work situation. Illegal. There are even strict rules about how often you can have a garage sale. Car ownership is de facto mandated because no one can physically function in suburbia without one. This isn't an accident. It's by design. It's a myth that America is the Land of the Free where private property rights are sacrosanct. We're all very much limited in what we can do in our own homes - for the common good. Argue about which values are better, but don't pretend anyone has a choice when it comes to conforming in either system.